Upon hearing Hillary's ad announcing that she is running for president, I thought, these despicable people (Democrats) have no shame. The substance of Hillary's ad is same old, same old; standard Democrat low rent campaign tactics; class envy and victimhoodism. Democrats continue to make it easier and even encourage more Americans to forget working for a living and simple rely on government handouts. http://bit.ly/1FNZQ31 One can only conclude that this is Democrats' insidious strategy to win new voters. Who is going to bite (vote out of office) the hand feeding them? Folks, we are talkin' over 92 million Americans unemployed http://bit.ly/1FNVCIO, but still have cellphones, flat screen TVs and not missing meals. Whenever Conservatives and Republicans compassionately address the havoc in the black community left in the wake of the Democrats' failed policies, Democrats flock to their mainstream media buddy's microphones to proclaim these good Samaritan Conservatives and Republicans white-insensitive-racists. So, when Hillary and her fellow Democrats pretend to champion families, I want to say, "You got to be kidding me. Gag me!" Here we go again. Hillary comes out promising to be a champion of the suffering and down trodden which she and her party created. Hillary's campaign is standard Democratic Party bait and switch; a continuation of their screwing of America. These people are disgusting. Have they no shame? Hillary's game plan to win the White House is to continue the Great Democratic Party Deception: pretend to be an advocate for the common man while being the source of their problems; keeping them stuck in just barely getting-by-mode, enslaved to government and making it extremely challenging to rise to higher economic levels. Hillary is banking on a complicit mainstream media to help her pull it off, duping clueless voters. 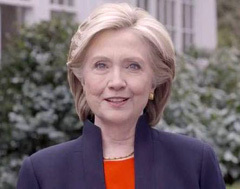 I pray that our GOP presidential wannabes will have the courage and wisdom to speak out against Hillary's deceptive, disgusting and arrogant I-think-voters-are-idiots standard Democrat campaign strategy.